If you have been wondering how to record your computer screen without having to spend tons of money on software, wonder no more! Soapbox is here. Wistia, the video hosting and sharing company, just released Soapbox today (June 12th, 2017). Now it is crazy easy to record your computer screen – with or without (or both!) your face (using your webcam). And it’s ridiculously fast. Great question. Soapbox is a free (I know, right!) Chrome extension. So whenever you feel like creating a video recording of your computer screen, just click the Soapbox icon in Chrome (see pic on the right) and start recording. Soapbox records BOTH your face, using your webcam, AND your screen. You just start recording, narrating whatever is interesting about your computer screen. When you’re done recording, you can edit your video, trimming start and stop points and choosing when to show just your face, when to show just the screen, of just leave both for the whole video. When you are done with that, click the giant “Share” button in the bottom right corner (see other picture on the right), and a link will be put into your clipboard. Just paste the link anywhere you want to share it. How Fast and Easy Is It Really? Very! From the the time I clicked the Soapbox icon, to the time I finished editing AND posting this into the space below, only about 45 seconds elapsed! That’s insanely fast and easy. I think anyone would agree. Yeah, it’s a pretty short recording. But if you have spent any time at all recording videos, and then uploading and sharing them on the web, you’ll know that it takes forever, usually. And most of that time spent in the editing, uploading and sharing pieces of that process.For example, I teach online courses (Check out free videos from one of those here: Free Videos From The Newbies Guide To Audio Recording Awesomeness) using Camtasia. On average it takes me an entire day to record, edit, upload and share a video lasting only 3 minutes! Granted, Camtasia offers a lot more bells and whistles for editing and creating. But if all you’re trying to do is send someone an example of how to do something on a computer, or show someone exactly what you are seeing, Soapbox is a no-brainer. What is Soapbox Good For? Since you can record your computer screen and show yourself, it is perfect for training. Not all training videos need to be slick productions. I make videos all the time for co-workers and friends. And as I mentioned earlier, normally it takes awhile even to record those. I actually (this was last week!) had a friend snap a picture of her screen with her iPhone and put that into a text while I was trying to help her with something! It would have been MUCH faster and better to record a video (as opposed to a static picture) and send me the link. And how often are you having an issue with something, and need to explain exactly what’s going wrong to a customer support rep? With Soapbox, just record a quick example of what’s happening and send the link. That could really speed up problem solving for you. 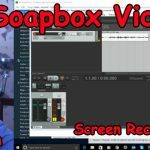 And of course, if you don’t really need to record your computer screen, but just want to send a quick video message to friends and family, Soapbox makes that easy and quick. Remember, when editing, you can just click the “head” icon and the video will only be of you minus the computer screen. I’m sure I’ve just scratched the surface here. Soapbox has such a lot of potential. Go get it for yourself right now. Remember – it’s free! There is a way to add a sweet freeze frame effect to your videos. A lot of people want to add cool effects to their videos and the freeze frame effect is one that is really cool. Some of the best video editing tricks are very quick and you can barely pick them up with your conscious mind. In the end, you will have an effect that adds a brand new dimension to your video. Photos and videos are getting some new features and upgrades from Apple. On the iPhone, filters can be used while taking the photo, and new live options such as photo-looping and picking from live frames are coming out. These are based on longer exposure times and are part of iOS 11. Enhanced compression of photos and videos on the Macbook will lead to more storage room. This new encoding will not reduce video quality. The native Photos software is getting a facelift too. Camera features have been updated in the iOS 11, including enhancements in portrait mode, live photos, and Boomerang-like features. Changes are coming for Macs as well, with technology that will allow photos and videos to take up less space. The updates that are planned to be released to iPhone and Mac users seem to be geared towards those in the professional field, rather than just the everyday user. There is a huge sale at B&H for lenses and optics for DSLR cameras. Nixon camera bodies are discounted by 1100 dollars this week, while Canon bodies are 500 dollars off. You can even save up to fifty percent off of camera accessories and drones during this sale period. When purchasing online, the promotional code “BHOPTICS17” is necessary to take advantage of the deals. The sale is taking place in regards to the Optic 2017 conference. This dance video is interesting. It uses stop motion which means it took more time and work to produce than if the dance was just done outright. Info on how it was made is given here so you can make your own video like this. You can employ your creativity to make a great video which will get a lot of attention. Stop motion allows for a lot of effects you can’t normally do in real time. A documentary called “Off the Tracks” is going to show when Apple put Final Cut Pro X into the video industry in 2011. When the first version was released, it was incomplete and you had to start all over on any projects you wanted to use on it. The Magnetic Timeline took out the flash frame/black frame isssue and thats what helped the Final Cut Pro X stand out from the others. J-cuts and L-cuts became easier with just a few clicks. Canon has come up with a camera that is offering some of the same specs as some of the more expensive cameras in this same category. The Canon C200 is a direct upgrade to the C300 with minor but definitely noticeable changes, which include touch focus LCD and a new RAW cinema light format. These additions plus all of the features that professionals look for make this a prime camera for a good price. Most cameras in this class are in the $10,000 range while this new C200 comes in at $7,500 making it a great by for the consummate professional. Canon is introducing two new cameras that will offer great high definition video recording. Canon has two different cameras with minor difference’s allowing for two different price points for the discerning camera enthusiast. The canon c200 is more suitable for cinema and traditional recordings with on board LCD monitoring source while the c200b is more suitable for drone usage being that is does not have the onboard LCD screen. Both versions offer 8.85 megapixel CMOS sensor and both offer 4K video formats as well as Canons RAW light source. Both cameras offering similar specs with little variations means that one could go with the lower price point yet still purchase a high quality camera. Video production is a fast growing field thanks to human being need to be visual creatures. Online courses and internet marketers are now using video as a main source of advertising and teachin. The author states that A DIY studio can be set up for as little as 60 dollars. All you’d have to do is buy a tripod and use your phone’s and lapptop’s video camera with the right video editing software. Somehelpful tips included never using the zoom function and shooting at frames per second. People are drawn to video content more than any other type of content. It can be moderately easy and affordable to start making your own visual content for viewers. You don’t have to know a lot about videography or editing to be successful in starting a blog or channel.